ArtsCape is located at 45 Jackson St, Wynyard. Phone 0409 700 918 or 0408 590 421. Everyone who meets local identity and painter Peter Sargison remembers him for his huge personality. It doesn't take long to forget he was born without arms. Painting without arms is no different to anything else in Peter's life... he just uses his feet. To know Peter is to admire his dexterity, determination, good humor and capacity to tackle almost anything he puts his mind to - from getting around town, to studying or becoming an artist. 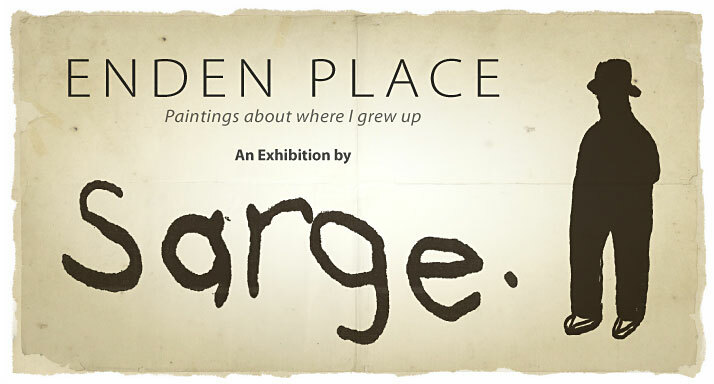 Peter has painted for years, and Sunday December 4th sees his biggest and most ambitious exhibition opening at Artscape in Wynyard. A local identity along the coast, Peter was born in Zeehan in 1959 and moved to Enden Place Somerset in 1964 as a 5 year old. This exhibition is a selection of paintings and prints about his experiences growing up like any just other kid, riding scooters, running and jumping and falling over... "look Mum no arms!" "When we moved in to Somerset it was all barren land, only six houses," says Peter. "There were pea-farms on the hills behind Somerset where the house are now and we used to slide down those hills and pick peas to eat them. You try eating peas with your toes, it's a snack!" Always the comedian Peter's laconic sense of humor is reflected in this whimsical exhibition. 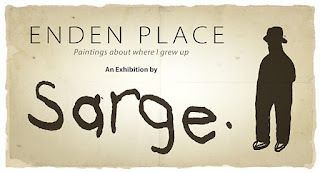 Showing at Artscape in wynyard, the paintings have given him a chance to reconnect with his memories of growing up in Somerset. The exhibition comprises a series of prints of his father bushwalking, images capturing the Wynyard Show and number of paintings houses where he used to run amuck in Somerset. "There is a story behind every door," Says Peter. "People might think its easy to feel sorry for a kid growing up with no arms, but to be honest, I was a bit of a bully. I used to throw rocks at the other kids, but their mothers would never believe them, so I'd get away with it!" The exhibition represents eleven months in the studio, working alongside artist Rebecca Lavis. As well as the prints and paintings there is a series of "zines," in which people can quickly read more about Peter's unique view of life. For years Peter has put back into the community, public speaking, visiting primary schools, studying at TAFE and helping out at places like Multicap. These mini-magazines also tell another humorous side of Peter's story, riding a scooter with no arms at four, trying artificial arms as a kid and then throwing them away, amazing other motorists steering his car with his feet, going AWOL after some wild partying and a little bit of a heart attack and returning to his art. This is a remarkable exhibition from an accomplished local artist who loves painting and through the support of North West Residential Services and Rebecca Lavis has recently become prolific in his output in prints, paintings and the written word.